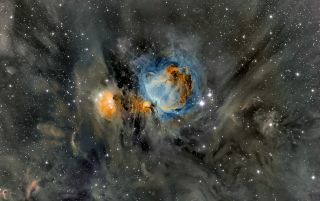 The Orion nebula glows in vivid clouds of blue and yellow in this beautiful image recently sent to Space.com. Fields' image is a compilation of narrowband data in SII, HA and OIII. It is the result of more than 14 hours of data and synthesized using Photoshop. The Orion nebula is located roughly 1,500 light-years from Earth and stretches 40 light-years across. It can be seen with the unaided eye near the belt of the three stars in the constellation Orion. A light-year is the distance light travels in one year, or about 6 trillion miles (10 trillion kilometers). The nebula's colors seen in the region of star formation are created by oxygen and hydrogen gas emission.To see more amazing night sky photos submitted by Space.com readers, visit our astrophotography archive.